I have had many people say they enjoy my “home of the day” postings on my Facebook page. To see them, visit my page and hit the “Like” button. If you do that, they will show up in your Facebook newsfeed. Have a great weekend and a productive week! 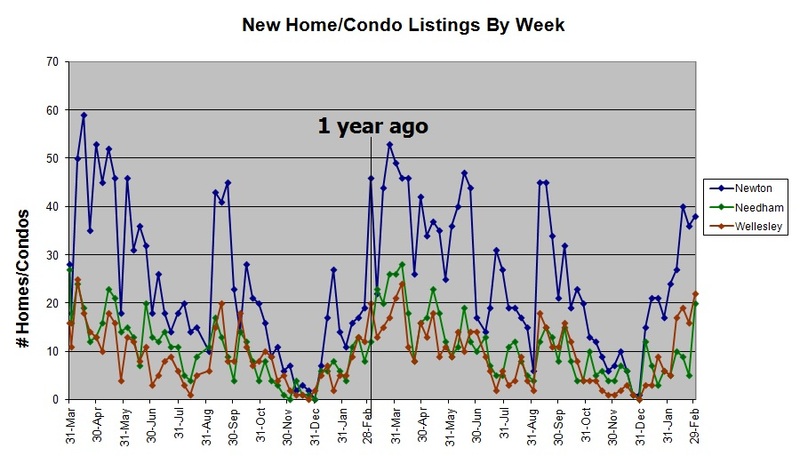 Very interesting week in Needham, Newton, and Wellesley real estate. 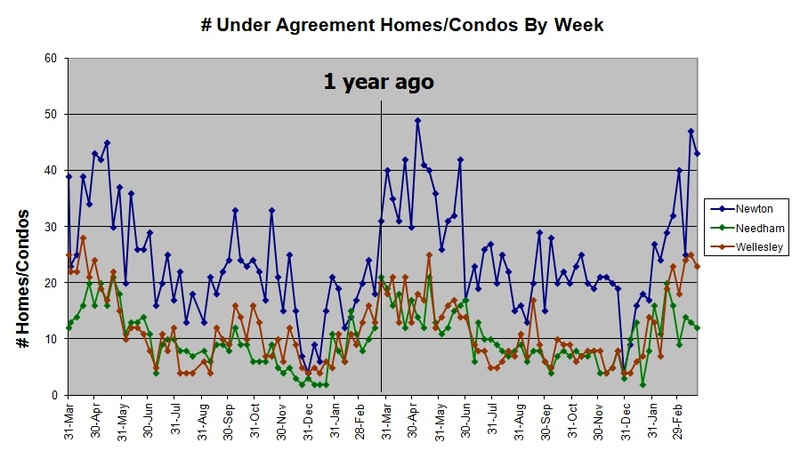 New listings and under agreement listings went down in all three towns this week. Having said that, when I look at the spring market to this point, it is clear that this year is much stronger than last year. The under agreement numbers look much stronger in all three towns. 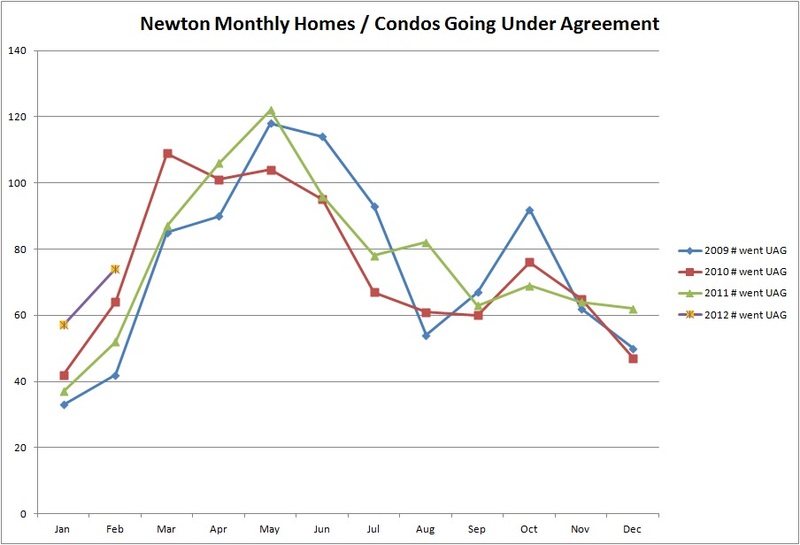 If you look at the Newton under agreement graph, the first week they got over 30 last year was this week but this year Newton has had four weeks over 30 already. In fact, I have been watching some homes go under agreement that were on the market forever. 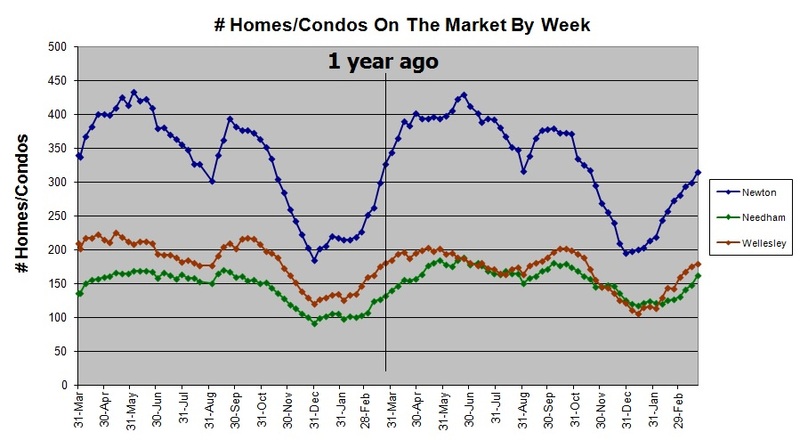 To me, this is a sign that the buyers are hungry and the sellers are not adequately feeding them. This week there were multiple “domino” listings as I call them. These are listings where a home on a given street goes under agreement and then one of the neighbors gets all excited and lists their home to see if they can get some of that buyer activity. Often the second home is overpriced but sometimes it works. 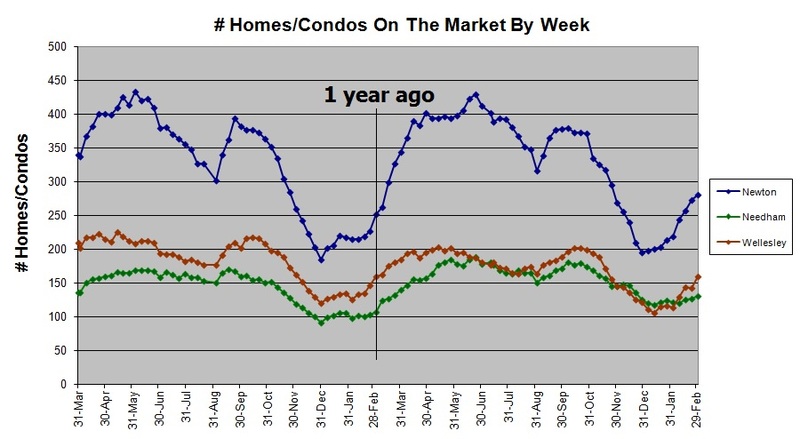 The good news this week is that the number of homes and condos on the market continues to rise, as it does this time of year, so the additional options should help drive activity. Each day I select one Home of the Day from Needham, Newton, and Wellesley. You can receive them by going to my Facebook page at http://www.facebook.com/conciergerealtor and hitting the “Like” button. They will then show up in your Facebook newsfeed. They are also simultaneously posted to Twitter in case that is your preference. 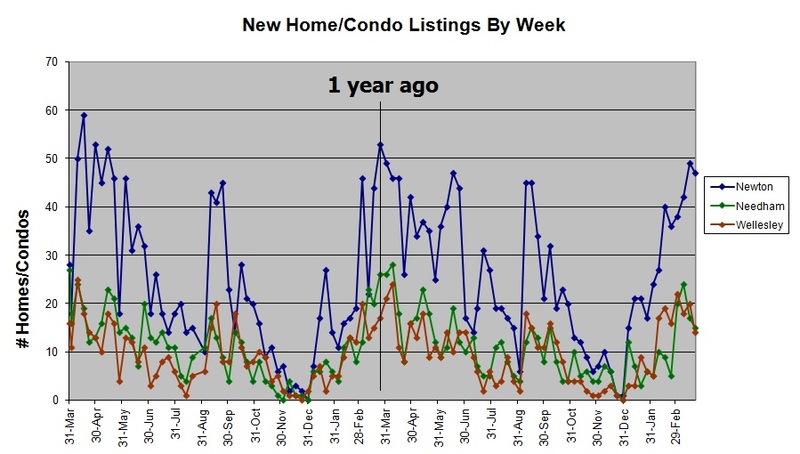 This week in Newton and Wellesley, both new listing numbers and under agreement numbers were up at peak levels as their markets continued to sizzle. It is hard to say that Needham is fizzling, because there is a lot of activity, but this week the new listings dropped back below 20 and the under agreement number dropped to 13. 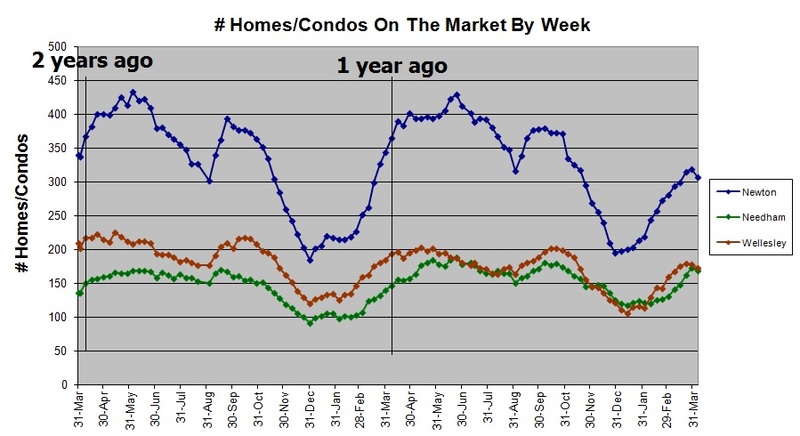 Those are good numbers but not what we would expect from this point in the spring market. From where I sit though, it feels like the Needham market is very active so stay tuned and expect a turnaround this week. Characteristic of the spring market, many of the new listings this week are already under agreement. In Needham 5 of 17, in Newton 14 of 49, and in Wellesley 6 of 20 are under agreement. Check out my Home of the Day listings by “Like”ing my facebook page at www.facebook.com/conciergerealtor. Each day I highlight one interesting new listing in either Needham, Newton, or Wellesley. There are some pretty amazing homes in our market. Have a great week. Enjoy tomorrow’s open houses, there are going to be a lot of them. Looking at homes sold and homes that went under agreement, there is no doubt about it. We are off to our best start in four years. 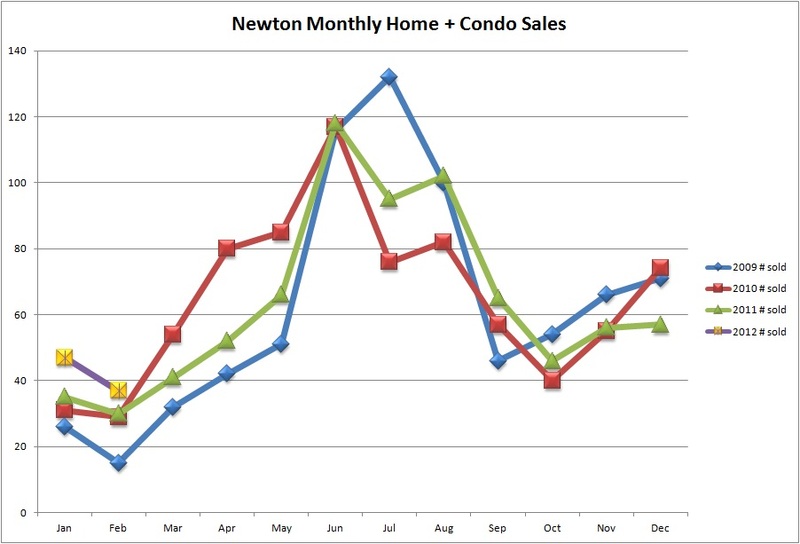 In Needham, Newton, and Wellesley, as the graphs below show, we are off to a great start. The strong start is due to some mix of the weather, record low interest rates, and the improving economy. I will tell you that while February was busy, our office is humming right now. There is a level of activity right now that I have not seen in a long time. It promises to be an exciting spring real estate season. 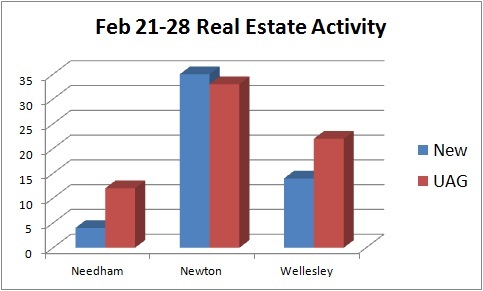 Needham, Newton, Wellesley real estate update: Lots of buyers in Newton, Lots of sellers in Needham and Wellesley. 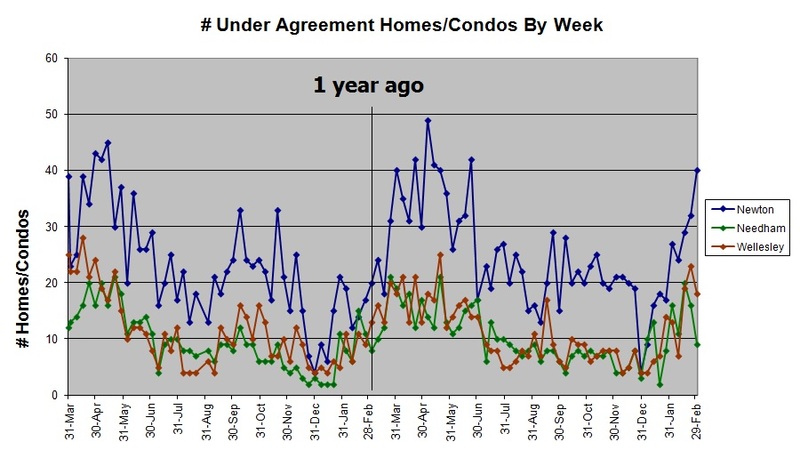 Based on the large number of new listings in Newton the last two weeks, this week the number of under agreement listings went way up (from 32 to 40). Only 4 times in the last year was that number higher. 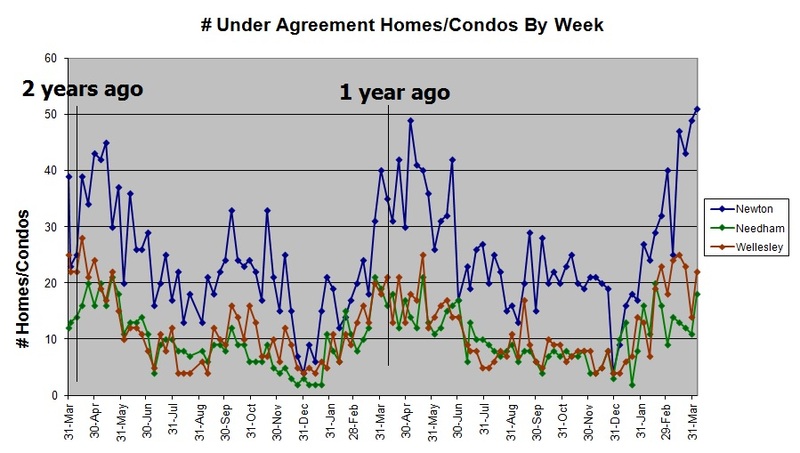 Half of the homes / condos that went under agreement this week in Newton had been on the market for less than 30 days – a sure sign of spring market activity. Interestingly, only 4 of the 40 that went under agreement were over $1m. Meanwhile, I did an unusual mid-week blog this week asking the Needham sellers to come to the party and I guess they paid attention. 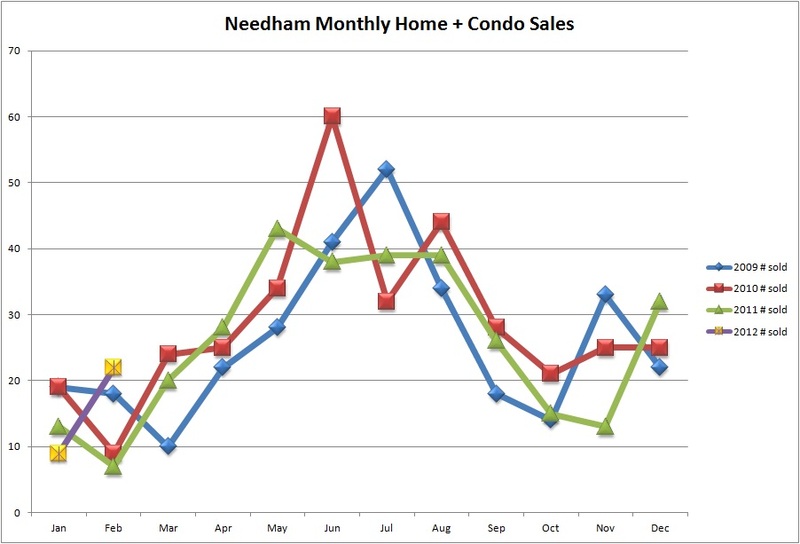 The number of new listings in Needham shot up this week from 5 to 22 including 6 over $1m. It is worth noting that the list prices skipped the range from $1m to $1.2m. 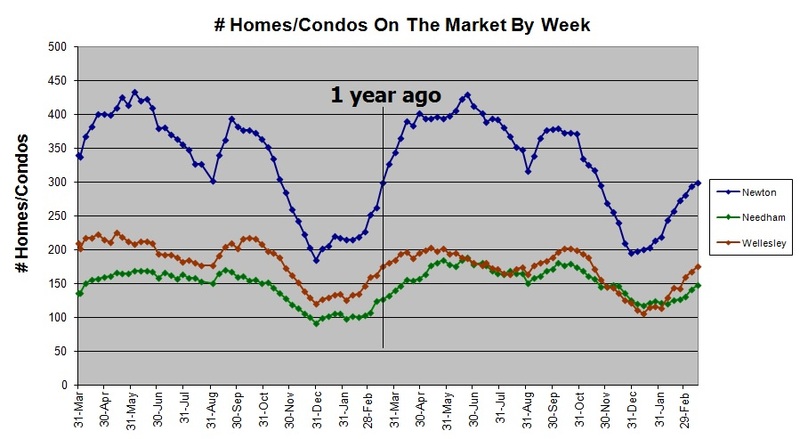 It seems the builders are now targeting a higher price point for the new construction homes. Overall, there are 11 homes on the market in Needham between $1m and $1.2m while there are 21 homes between $1.2m and $1.4m. 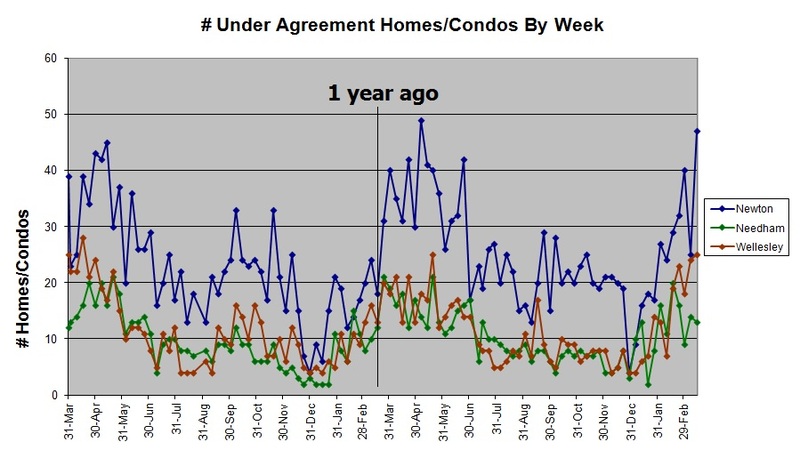 The number of under agreement homes in Needham this week was down reflecting the anemic number of new listings last week. Expect better things from Needham this coming week. 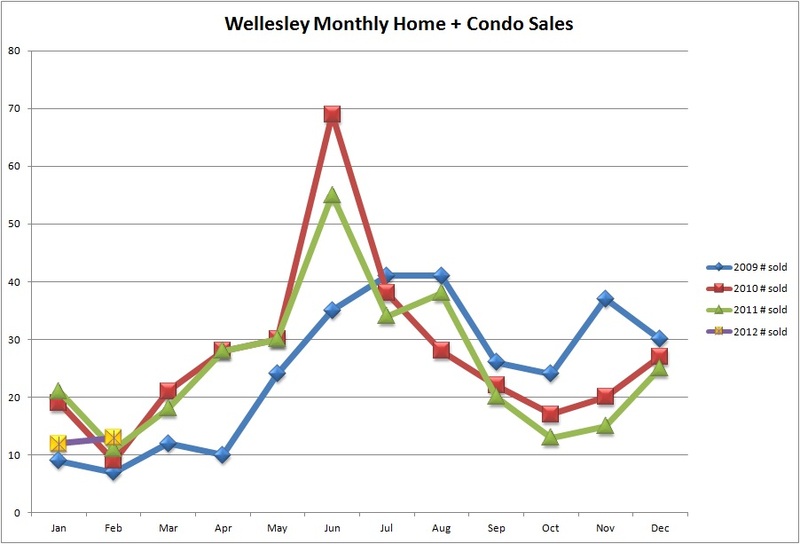 Wellesley is not to be ignored posting 22 new home / condo listings this week, which is a number exceeded only once in the last year. 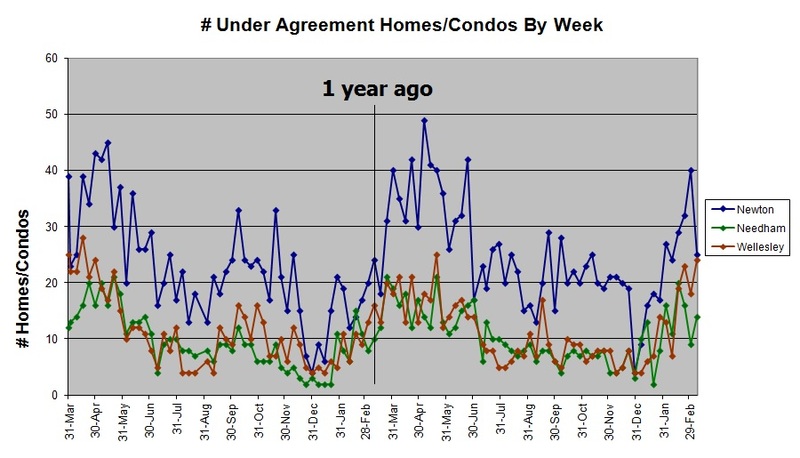 The number of under agreement homes / condos this week in Wellesley was off some (23 to 18) from last week but it is still a very respectable number for this time of year reflecting an active real estate market. Now is the time to jump into the real estate market. 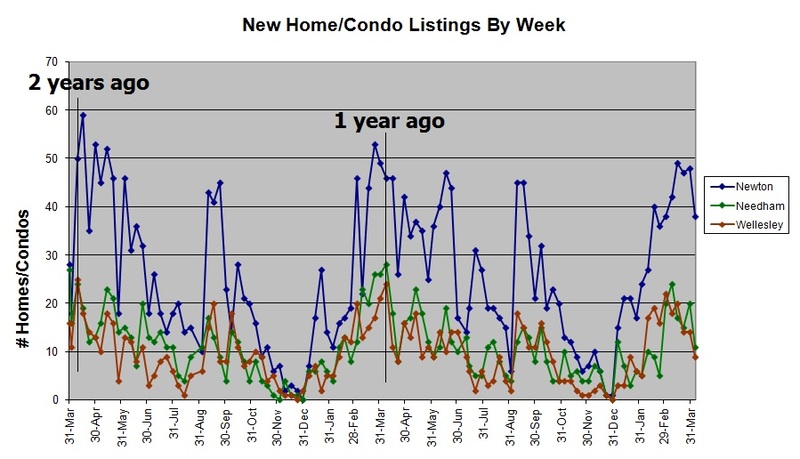 Your options are the best this time of year if you are a buyer and if you are looking to sell your home, the next 6 weeks is the most active time of the year. “Like” my facebook page (www.facebook.com/conciergerealtor) to get my Home of the Day postings to see my pick for the most interesting new listing each day – full disclosure, I’m partial to late 1800’s victorians. You can also follow my blog on http://needham.patch.com. Needham home sellers – where are you hiding? This is the spring market. 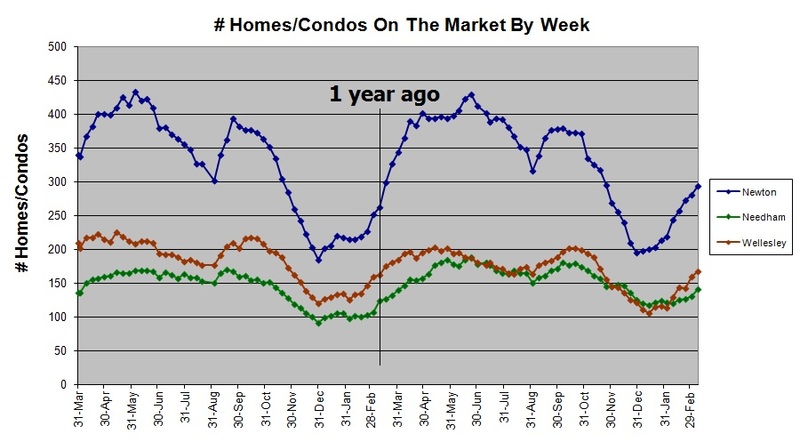 The weather report for Wed/Thu notwithstanding, this is the time of year that things really heat up in the real estate market. 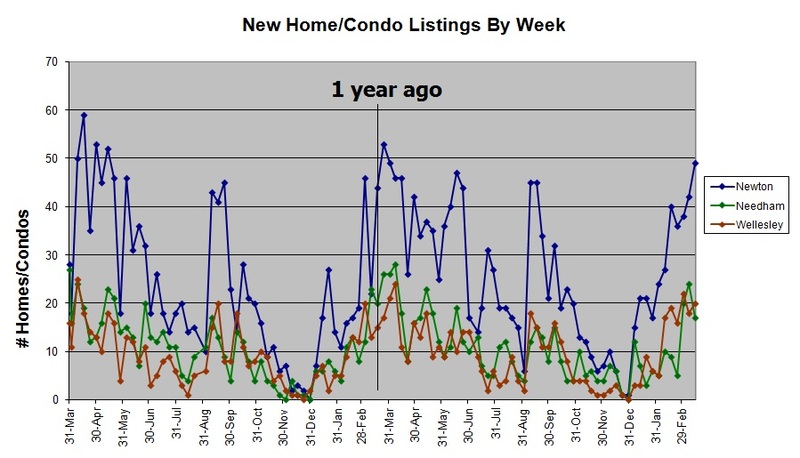 Newton has 35 new listings in the last week. Wellesley has 14. In Needham though, only four. Hey Needham, what’s going on? 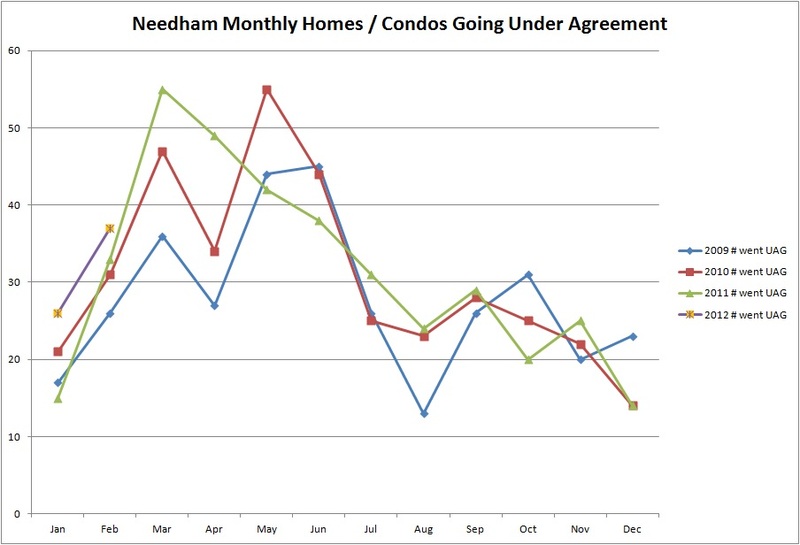 Its not like the homes in Needham aren’t selling. 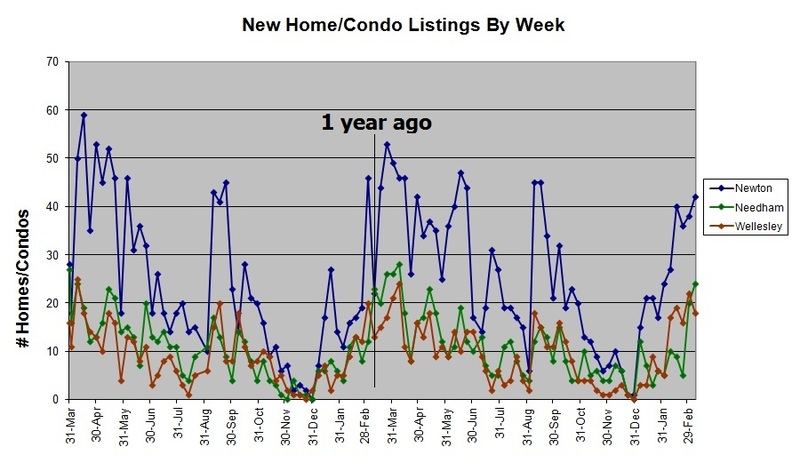 In the last week while only 4 new listings came on the market, 12 went under agreement. One of the 4 new listings is under agreement. In Newton, 6 of the 35 new listings are under agreement. 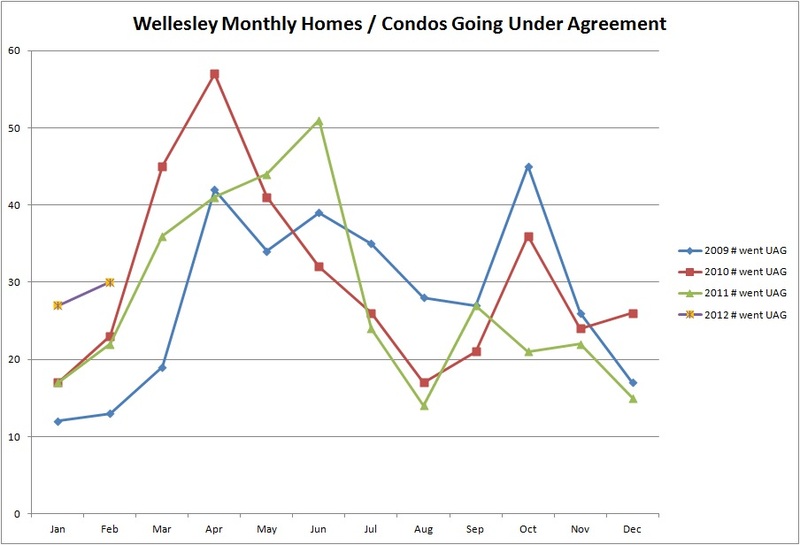 In Wellesley, 3 of the 14 new listings are under agreement. If you are considering a move this spring, now is the time! Give me a call today and we can work out a plan for getting your home on the market so you can take advantage of this great window for selling. My cell is 781-929-2453 and it is always on.